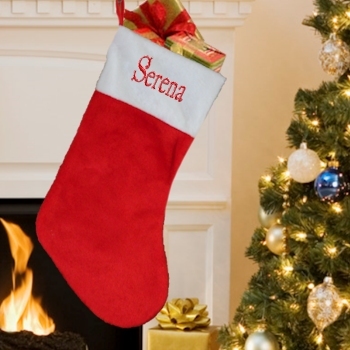 This lovely Christmas Stocking is made with plush red and white fur and is lined on the inside and has a red satin hanging loop too. This is a festive 48cm length Christmas stocking that you can have Amys Gifts personalise with a short name or initials beautifully embroidered in red Christmas Print font making this stocking a special Christmas decoration. Please fill in the personalised name in the text box provided. Please check your spelling. There is a limited amount of space to embroider on and we will make the lettering as large as we can depending on the length of the name.